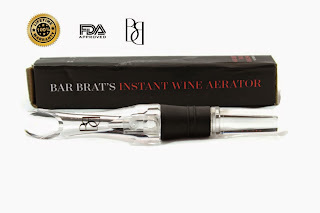 Recently I received a wine aerator from bar brat . What a difference in the wine by using a aerator . A aerator releases a bouquet of aromas from the wine , oxidizing your white , red and rose wines . It makes cheap bottle of wine taste so much better . I'm in love with mine and probably won't drink my wine without one . Have you ever used an aerator ?